Dr Raj Persaud is a Consultant Psychiatrist and Consultant Editor of 'The Mind: A Users Guide' published by Bantam press. Dr Peter Bruggen is a retired Consultant Psychiatrist and author of Who Cares? : True Stories of the NHS Reforms published by Jon Carpenter. As doctors start voting from today on whether to strike in the UK, what's the likely impact of withdrawing medical care on the health of the nation? The doctor's union, the British Medical Association, seems to be gambling that the government doesn't want to alarm the electorate. But when doctors strike, the scientific research evidence finds that patients stop dying. 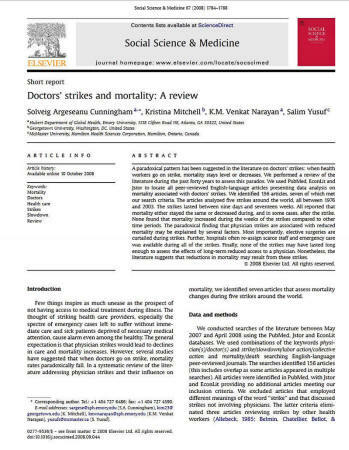 The most comprehensive review of the medical impact of doctors' strikes is published in the prestigious academic journal Social Science and Medicine. A team lead by Solveig Cunningham and Salim Yusuf at Emory and Georgetown Universities in the USA and McMaster University in Canada, analyzed five physician strikes around the world, all between 1976 and 2003. Doctors withdrew their labour, in the different strikes analyzed, from between nine days and 17 weeks. Yet all the different studies report population mortality either stays the same, or even decreases, during medical strikes. Not a single study found death rates increased during the weeks of the strikes, compared to other times. For example, in a strike in Los Angeles County, California in January 1976, doctors went on strike in protest over soaring medical malpractice insurance premiums. For five weeks, approximately 50% of doctors in the county reduced their practice and withheld care for anything but emergencies. One analysis, quoted by Cunningham and colleagues, found the strike may have actually prevented more deaths than it caused. It's the fact that elective, or non-emergency surgery, tends to stop during a doctors' strike, which seems to be the key factor. It looks like a surprising amount of mortality occurs following this kind of procedure which disappears when elective surgery ceases due to doctors withdrawing their labour. Mortality declined steadily from week one (21 deaths/100,000 population) to weeks six (13 deaths) and seven (14 deaths), when mortality rates were lower than the averages of the previous five years. 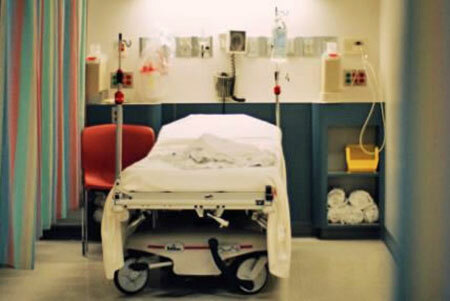 However, as soon as elective surgery resumed, there was a rise in deaths. There were 90 more deaths associated with surgery for the two weeks following the strike in 1976 (i.e. when doctors went back to work) than there had been during the same period in 1975. But, unlike Los Angeles, what about the impact of doctors' industrial action where the majority of doctors participate, and the strike lasts several months? Cunningham and colleagues report on a strike in Jerusalem from 2 March to 26 June 1983 due to a salary dispute between the government and the Israel Medical Association (see 'Doctors' Strike in Israel May Be Good for Health'). 8000 of Jerusalem's 11,000 physicians refused to treat patients inside hospitals, though many of them set up separate aid stations where they treated emergency cases for a fee. One analysis examined death certificates from several months surrounding the strike period, 16 February-3 September 1983, and from a control period the previous year, 17 February-3 September 1982. Mortality did not increase during or after the strike, even when elective surgery resumed. The pre-strike deaths for the control period and the strike period were identical at 89; there were six fewer deaths during the strike than during the control period, while in the ten weeks following the strike, there were seven more deaths than there had been in 1982. In an intriguing example of how a doctor's strike can backfire, the authors of this particular mortality analysis argued this apparent lack of impact of the strike on mortality suggests that there was an over-supply of doctors in Jerusalem at the time. The problem with drawing conclusions remains that the strike did not involve the whole scale deprivation of medical services. Cunningham and colleagues point out in their review paper that striking physicians opened aid stations, supplementing medical care and preventing people from mobbing the hospitals. While physicians were technically on strike during the four months of the dispute, most did not in fact adhere to the industrial action regulations. In truth, most doctors in Jerusalem provided care in a private or partially private context, so, while participating in spirit, they did not actually withdraw services. Another intriguing study analyzed changes in mortality by studying the Jerusalem Post's newspaper reports of funerals during another Jerusalem doctors' strike, this time between March and June of 2000. This one arose from the Israel Medical Association's conflict with the government's proposed wages. The hospitals in the area cancelled all elective admissions and surgeries, but kept emergency rooms and other vital departments, such as dialysis units and oncology departments, open. The funeral study found a decline in the number of funerals during the three months of the strike, compared with the same months of the previous three years. One burial society reported 93 funerals during one month of the strike (May 2000) compared with 153 in May 1999, 133 in May of 1998, and 139 in May 1997. 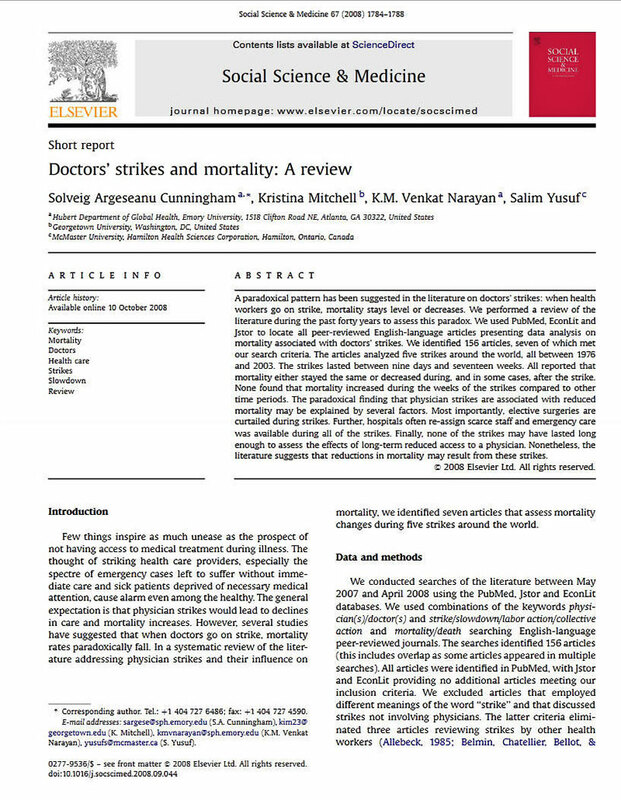 Cunningham and colleagues summarize their review of research assessing the effects of doctors' strikes on mortality, finding that four of the seven studies report mortality dropped as a result of medical industrial action, and three observed no significant change in mortality during the strike or in the period following. There are several possible interpretations for this surprising finding. One is that as its elective or non-emergency surgery which is usually most effected in a doctor's strike, it could be the mortality findings reflect an impact of elective surgery. The findings might be important because they perhaps illuminate the relatively high risks of elective surgeries, which may actually increase mortality. If it wasn't for doctor's strikes, this might be a finding, ironically never otherwise properly highlighted. Another sobering possible conclusion is that the public, and perhaps doctors themselves, overestimate the ability of medicine to stave off or have an impact on mortality. The problem with interpreting the data, as Cunningham and colleagues point out in their review paper, in all medical strikes studied so far, not all doctors down tools. In the 1976 Los Angeles strike only 50% of physicians were involved. So doctors' strikes don't necessarily drastically reduce access to health care. Given the purpose of most strikes is to deprive management of the worker's labour, and it's benefits, this raises the sobering question of how effective a doctors' strike can ever be in comparison to other occupations. The very difficulty in getting physicians to withdraw their labour in the way other occupations can do, hints at a fundamental difference between what it is to be a doctor, compared to pursuing other ways of making a living. A doctor, the research on strikes illuminates, isn't something you do, it's something you are. This issue of identity is why it's so much more difficult for doctors to simply discontinue practicing medicine. It's a character flaw prone to exploitation by governments and employers, effectively frustrating standard union tactics. Another theory as to why patients live longer when doctors go on strike, is that the profession finally shakes off the shackles of its employer's restrictive practices, and returns, albeit temporarily, to practicing medicine freely, as it would really like to. And perhaps, British Medical Association take note, that's actually the most effective sort of industrial action doctors can ever take. This information is a follow-up of the Institute of Medicine report (To Err Is Human - Building a Safer Health System) which hit the papers in November of last year (1999), but the data was hard to reference as it was not in peer-reviewed journal. Now it is published in JAMA which is the most widely circulated medical periodical in the world. What does the word iatrogenic mean? This term is defined as induced in a patient by a physician's activity, manner, or therapy. Used especially of a complication of treatment. If the higher estimates are used, the deaths due to iatrogenic causes would range from 230,000 to 284,000. In any case, 225,000 deaths per year constitutes the third leading cause of death in the United States, after deaths from heart disease and cancer. Even if these figures are overestimated, there is a wide margin between these numbers of deaths and the next leading cause of death (cerebrovascular disease). This might be tolerated if it resulted in better health, but does it? Of 13 countries in a recent comparison, the United States ranks an average of 12th (second from the bottom) for 16 available health indicators. "behaves badly by smoking, drinking, and perpetrating violence." However the data does not support this assertion. Among 29 countries, the United States is second only to Japan in the availability of magnetic resonance imaging units and computed tomography scanners per million population. The June 10, 2000 issue of the British Medical journal reports on an interesting statistic that has occurred in Israel. It seems that three months ago physicians in public hospitals implemented a program of sanctions in response to a labor dispute over a contract proposal by the government. The article stated that the Israel Medical Association began an action in March to protest against the treasury's proposed imposition of a new four year wage contract for doctors. Since then, the medical doctors have cancelled hundreds of thousands of visits to outpatient clinics and have postponed tens of thousands of elective operations. To find out whether the industrial action was affecting deaths in the country, the Jerusalem Post interviewed non-profit making Jewish burial societies, which perform funerals for the vast majority of Israelis. "The number of funerals we have performed has fallen drastically." "There definitely is a connection between the doctors sanctions and fewer deaths. We saw the same thing in 1983 when the Israel Medical Association applied sanctions for four and a half months." "Mortality is not the only measure of harm to health." "Elective surgery can bring about a great improvement in a patients condition, but it can also mean disability and death in the weakest patients."